Smetana / Dvořák - Bedřich Smetana - Mediální ohlasy - ArcoDiva management - Hudební agentura - Hudební agentura ARCO DIVA Management s.r.o. 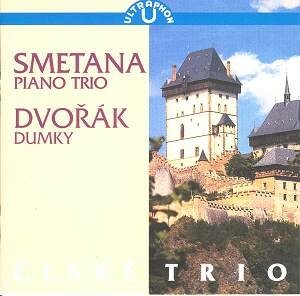 These are two of the best known Czech trios and are here performed by a trio that must know them very well. They are both "dark" works and the background to their composition does help when getting to know them. The Smetana Piano Trio was written following the death due to scarlet fever of the composer’s three year old daughter Bedriska in 1855. During three years Smetana lost three daughters but it was Bedriska that had already shown promise. Her loss hit the composer greatly. Liszt liked the work but otherwise it was not a success and not published until 1879. All the movements are in G minor and the first is almost unrelenting in its tragic overtones. The beginning is very effective with the violin’s solo cries. Musically the format underlines the tragedy. The Czech trio has a real feeling for this music and is very effective in transmitting a sense of loss. The second movement has some lovely "Slavonic" playing from the violin and a more resigned tranquility. Lovely plaintive playing dominates the middle section before anguish returns. There is a real feeling of ensemble here and this is well captured by the engineers. The finale starts with much more energy and uses a theme from his piano sonata. However any positive feelings dissipate with funereal tones towards the end. This is beautifully played and as the piece comes to a highly charged conclusion, the trio plays as one. Not an easy listen but the piece finds splendid advocacy from the Czech players.